There are two kinds of "ore minerals", the sulfides and the oxides. There is good reason to select sulfides, oxides or native elements for use as ore minerals. The chemistry necessary to separate the metals from these minerals is easier and more efficient than trying to separate them from silicates. 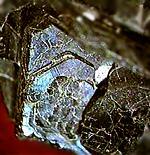 The two most common sulfides are both iron containing, FeS2 (pyrite) and FeS (pyrrhotite). 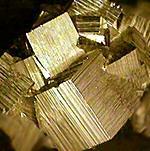 Sulfides generally look metallic, often grey, silverish or brassy. Pyrite has been called "fools gold" for many years as it has been the culprit in many false claims of gold discoveries. The lead sulfide, galena, the zinc sulfide sphalerite, and the copper sulfide, chalcopyrite are the main ores for each of their associated metals. There is a more rare sulfide found here in Michigan, NiS (nickel sulfide) is found in the Wallace Stone Pit, in Bayport. 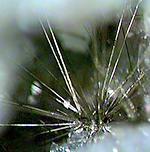 It is called millerite and forms in small metallic radiating needles. Iron is obtained more from oxides than sulfides, although the sulfides are quite common. The two oxides, magnetite, and hematite are the economical ores for iron. 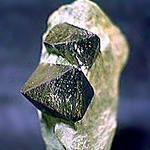 Magnetite (Fe3O4) and hematite (Fe2O3) both have metallic luster and have high specific gravity. There are large deposits of hematite in the upper peninsula of Michigan, around Marquette and Menomonee. Other oxides of major interest include rutile (TiO2), cassiterite (SnO2), and uranite (U3O8). Each is the main source for its metal, Ti (titanium), Sn (tin), and U (uranium).